It was only a matter of time before I was going to own one of these. Having used the 16700A on the job more than 10 years ago, it was one piece of kit I never forgot the enjoyment of using. It also was inevitable that it’d be an 1670X that I’d go for, not for cost reasons, but to some extent. The affordable 16900’s are clapped out old Pentium III based units that won’t go to anything newer than the ancient Windows XP. This HP-UX based unit on the other hand, is timeless. One of the first jobs: Replace that flaky, slow old SCSI hard disk with something a bit more modern. As no one has demonstrated any kind of practical (and cost effective) SSD solution for these units yet, I’m not keen to go splashing out on an expensive SCSI to SATA adapter which’ll be unlikely to work. 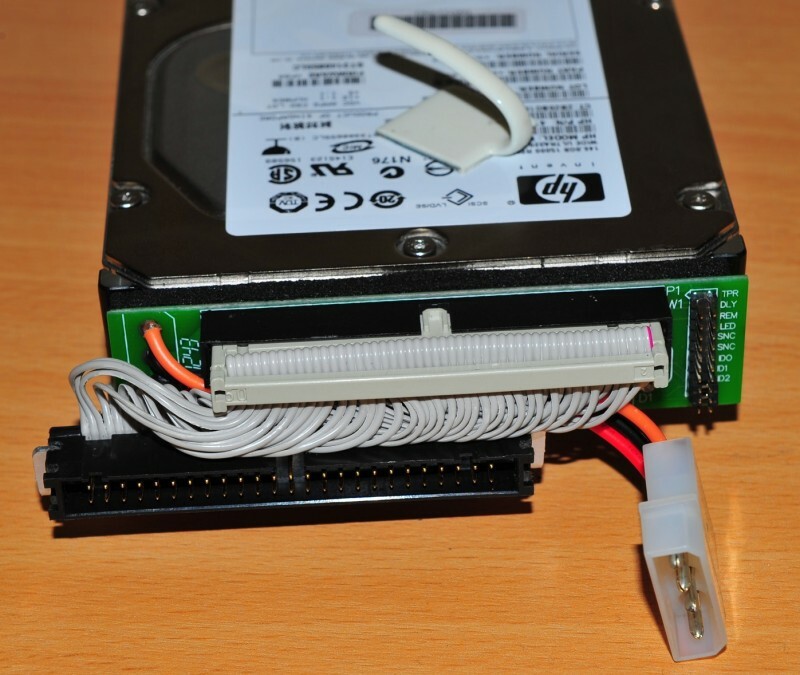 The best hard disk option for repairers appears to be using SCA Ultra320 hard disks from old servers. They’re inexpensive, good performing, large and plentiful. But first there is an annoying problem: Mine being one with the built in CD-ROM, the hard disk is mounted the opposite way to CD-ROM less units, and the offset of the connector with adapter on the incumbent disk arrangement makes it almost impossible to fit the SCA disk with adapter without slashing up the metalwork, or rebuilding the large SCSI ribbon cable, so I’ve had to make up this little “offsetter” cable to deal with it easily. During the re-install I found that the installer just couldn’t seem to cope with the 146GB drive I had installed. I don’t think it’s completely impossible but the LVM configurator is hard coded to always use the whole drive, then complain that it’s too large for the bootloader to boot from. In the end I copped out and installed it on another 9.1GB disk and DD’d it over to my new drive. The bootloader doesn’t mind massive drives, just so long as the root VG doesn’t span its entirety. I’m not sure where the line between ‘works’ and ‘doesn’t work’ is in terms of disk size, but can confirm that a 73GB drive works, whereas 146GB doesn’t. Maybe 128GB is the maximum? That took about 5 hours. Note here that SCSI ID 5 is the old 9.1 GB disk I just installed the OS on, and ID 6 is the newer 146GB drive. This had the disadvantage that I’ve wasted most of the drive, but it’s not like it’s ever going to be needed, and only using less than 10% of the drive has considerable performance advantages as the heads barely ever have to move a millimeter to boot the LA. The upgrade was definitely worth it. With the old drive radiating enough heat to cook a steak, and producing the sound of a hundred maracas in a washing machine, this new drive is cool quiet and a lot faster. It’s now more responsive, and also boots about 15 seconds faster than before. It’s just a shame the rest of it makes a noise level somewhere between a hovercraft and a jet engine. This is one tremendously exotic bit of RAM. 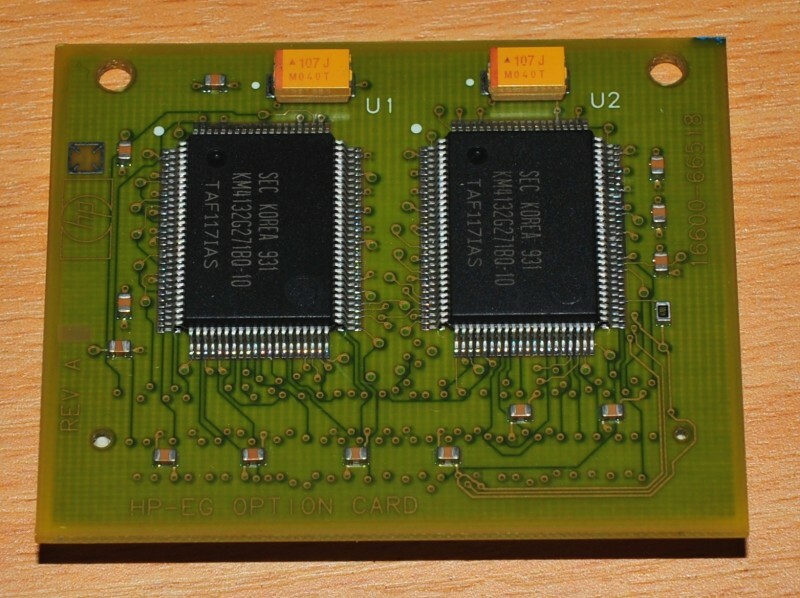 It is similar to the memory found in old HP-UX workstations which had between one and four 64MB memory modules, but this particular one is a completely logic analyser specific pair of 64MB modules on a single 128MB PCB, despite the system reporting it as two 64MB upgrades. Sadly these memory upgrades are only feasibly obtainable with a unit that was sold with them. Keysight apparently have some stock of the above upgrade, but with shipping and administrative charge, it’s cheaper to just buy a used Option 003 analyser, pinch its ram and throw it away. Even more difficult to come by is the video memory upgrade, which increases maximum resolution from 1280×1024 to 1600×1200. So far as I can tell this upgrade is effectively useless as it will only output 1600×1200 @ 75Hz which no LCD monitor will accept, as 60Hz is the maximum refresh rate for all LCD panels, unless the monitor happens to have some kind of intermediate buffering mechanism which I am unaware of any examples of. Interestingly though there is a “user defined” display mode which I hoped would allow entry of a modeline or EDID but thus far I have not found any interface to configure it. I was a little disappointed to find that after logging via Telnet using the “logic 192.168.0.x:0.0” format, that nothing happened? I don’t remember remote X11 being a difficult thing to use on these units. After trying all sorts of X servers, nothing worked at all! In the end, I followed this guide, got a shell on it, reset the password for the secret “hplogicz” user. to get into single user mode. Once you have a command prompt, you can use passwd root to change the root password. In my case I wasn’t interested so much in resetting the root users password (but what the hey, why not) – but instead the hplogicz user which is already in place for this kind of use. So it appears that on mine, the program that normally is supposed to start the remote session (/usr/sprockets/bin/sessionWrapper) wasn’t working, but can be manually fudged around by starting vp the old fashioned way. The SCSI2SD open source project works really well in my HP16700A…. for replacing that SCSI drive. It’s a nice solution, and is equally as fast as the SCSI drive it replaced — and much quieter. Did you have to do anything special w.r.t. the SCSI2SD to emulate the driver properly? I’m mostly interested in sector size and count. Did you just duplicate the parameters from the factory drive? From my own experience, that partition configurator in the installer pretty much ignores everything you attempt to specify in it, and calculates everything its self! hi keith did you get the scsi2sd working in your enviroment? i am struggling arround with the SCSI2SD card v6. hi keith what card did you exactly use and can you please tell me the exact steps you did i am truggling nearly 2 weeks already..
Maurice are you from holland, like me if yes please send me a direct email that si much more easy and maybe we can share info..
Charly, yes I am Dutch, but live in the US now… I updated the EEVBlog entry about fan replacement ( https://www.eevblog.com/forum/testgear/quieting-noisy-fans-a-hp-16702b-logic-analyzer/msg1379083/#msg1379083 ) , find the picture you can see how I installed it and removed most of the flatcable. You can PM me there. No clue how to do it here. ok, you are officially geekier than i am. That picture made my day. 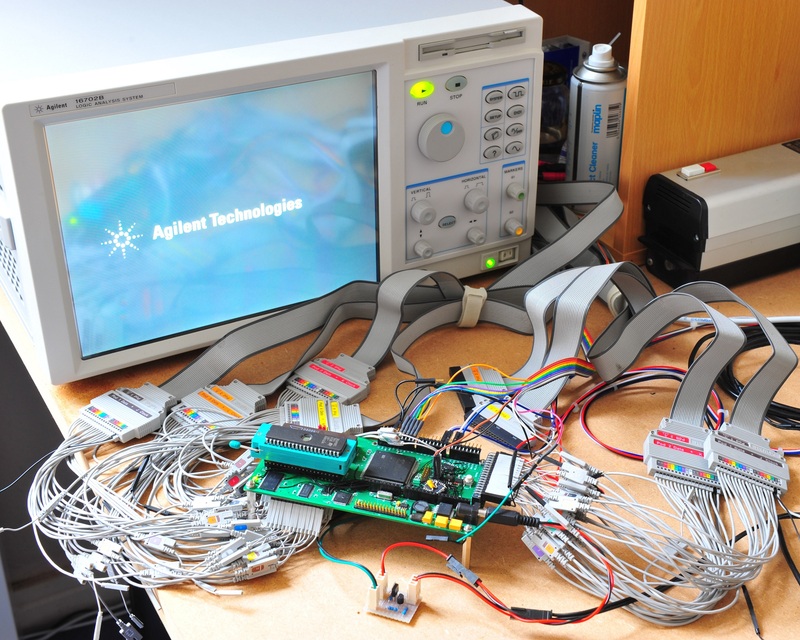 Not just using a logic analyzer but *modifying* it. I get by with an 8 bit saleae logic analyzer which is one of my favourite things. What did this bad boy cost? I liked the look of the Saleae but the max of 16 channels was a bit limiting. The project I mainly bought this for (8OD) requires around 50 channels to do a proper analysis. Fortunately these things are practically worthless these days. I believe this was US $1200 – which is pretty bargain basement considering what it would have originally sold for. Did you ever do anything with the fans? I’m sure there are more efficient/quieter fans on the market. Also, which SCSI standard is that drive? I think I’m going to go the route of SD/CompactFlash-to-SCSI for mine. The SCSI standard of the LA is Ultra SCSI (20MHz SE). The Drive standard is Ultra 320 (LVD/SE). I started looking at quietening it down, until I realised that the majority of the noise comes from the smaller fans in the power supply, which is quite a lot of work to get to let alone disassemble. On my 16702A, I replaced the three 120mm fans with four 120mm Noctua fans, and the two 60mm fans on the power supply with 60mm Noctua fans. Cost about $80 total. Brought the sound down from that of a jet engine stuck up against our eardrum, to a faint whisper. The biggest contributor to noise reduction was the two 60mm fans on the power supply, by the way, not the big 120mm fans. Also seems to cool a little better — with five cards in mine, it would every once in a while have cooling problems before the fan upgrade. Now, no issues. What specific Noctua Models did you use? Thanks a lot for this howto. I was able to set my 16700A for remote operation according to it. Now I don’t need to look for 1600×1200 LCD monitor with refresh rate of 75 Hz (which is unobtanium) as I’m able to use the full resolution of my PC monitor which is 1920 x 1080…. I was a bit afraid of how it will work over 16700A’s 10MB/s ethernet, but so far so good :). Great to find this page – I recently acquired a 16702B that was getting thrown out. Tried powering it on, fans spun up, power light flashed, and after about 10 seconds, head a loud pop sound and smelled burn silicon. Long story short, at least 2 of the IRFP450 MOSFETs in the power supply have blown. Have you ever seen this? I can’t seem to locate a schematic for the power supply (Celestica 7000). Caps in parallel with output of bridge rectifier test OK out of circuit; output of bridge rectifier appears to be shorted. Hello! I just bought an HP 16702B Logic Analyzer (just like yours!) with Option 003 and I want to upgrade the hard drive like you did. Where did you get the adapter for the hard drive and can you provide a link to where I can purchase the stuff to make the custom cable that you made? Thank you! The cable is a shortened version of a 30CM SCSI extension cable I bought off eBay. Link is no longer valid. As for the SCA -> 50PIN adapter board, pick one. There’s lots on eBay. If I were you I’d consider using a SCSI2SD adapter, you might find yourself expending less time and money! Thank you for your response Admin. I looked at the link to the SCSI2SD adapter last night. Am I right in thinking they use MicroSD cards? It was hard to tell from the pick. I’m a little worried about MicroSD cards. We’ve had trouble with them not lasting for a very long time. I mean, better named brand stuff seems to last better. I was under the impression though that SCSI tends to last forever! I do have to admit, I don’t have much experience with SCSI hardware though. Thanks!! Well it is your choice. I suppose it could be said that a good quality SCSI HDD would be more reliable than an SD card, but it’s more work to get it in there. Performance is largely irrelevant. The Analyser’s CPU is so excruciatingly slow that that HDD has to be very slow to be the bottleneck. If you go down the SCSI Hard disk route, don’t buy anything over 73GB, or you’ll be in real trouble trying to get it to work as I’ve mentioned on this post! Thank you. If I go the SD route, does the size no longer matter? If not, I’ll probably give the SD route a shot and see how it works. I’m just so excited. First time I’ve ever owned a Logic Analyzer and I think I made the right choice with the HP 16702B. Just can’t wait for it to arrive. It comes with two modules, a 16717A 333MHz state / 2GHz timing module and a 16740A 200MHz state / 800 MHz timing module (according to the E-Bay page). I don’t know much about these so the information might be wrong but those are the module numbers, 16717A and 16740A. I also managed to find a great deal on a 16534A two channel 500 MHz 2Gs/s digitizing oscilloscope module but the guy couldn’t get the triggering to work. Hopefully I can figure it out! I’m going to try and replace the fans when my LA comes. If you need a copy of the OS, I believe I have the latest version 2.90.00. I would like to get a copy of the latest OS. I just obtained a 16702B with three 16717 modules and all the cables and nice HP grabbers. Paid $685 bucks in an auction! i get 2 devices after typing SEA command..
how did you do the setting of the card ? which card did you use? and what about the termination? if you want to buy a SCSI2SD card buy the big one #v5.1 that is the latest working model . SCSI2SD #v6 is NOT working in combi with the Plextor cdrom. Termination problem…!! When P ping from the LA to IP 192.168.1.1 ( the computer it pings successfully. BUTTT…..when I I enter 192.168.1.2 in Firefox address bar it reports “Unable to Connect”. I’m stumped. Could you provide details how you got yours to display the LA screen over network ? Any help would be appreciated. Cheers. It sounds like your problem is more networking related, so can’t help you there sorry. The LA’s OS will present web interface and telnet out of the box, there isn’t an option to disable it. Only thing I’d say from looking at it – You sure 196.168.1.2 isn’t also in use by something else? Matt…thanks MUCH for the timely & helpful reply. Indeed was a network conflict….DHCP on internet wired connection 1 to ATT-Uverse modem router at 192.168.1.70 was somehow blocking LA address 192.168.1.2. I turned off the internet connection and bingo ! was able to access LA at 192.168.1.2 in Firefox web page. Your article mentions you use telnet for remote access to LA’s GUI. I tried telnet…no go….couldn’t find right “login”, “password”, and “displayname” terms. The LA is not in secure mode- no username or password needed to run the LA itself so I assume these fields are null value. So what syntax would I use to start telnet to access LA GUI? Again thank you for the interest. Glad to hear my advice was useful. Sounds like you’ve got a lot of reading to do! Hi, I have 16702B with mouse and keyboard problems. They are getting power to them and they are trying to communicate but nothing happening on the LA display. It doesn’t seem to be a hardware problem but I could be wrong. Unit has a touch screen and that works so I have been looking through the files for where things are going wrong but haven’t found anything related to these two devices. Any ideas will be appreciated and thank you for the post. Have a google for 16700 PS/2 ‘pull up resistors’. Thank you, that fixed it. Fixed mine as well – thanks! Does any one know what the Plextor CD ROM drive model that is used in the 1670x Logic Analyzers? Better yet, does anyone know what brand of external SCSI CD drives will work with the hp 1670x Logic Analyzers? I understand that the interface on the rear of the analyzer is single ended. This make me assume that differential (dual ended) drives may use the same connector. If you have a dual ended drive handy I cannot imagine that there would be an issue! I think my 16702B has the Plextor PX-40TSI UltraPlex 40x 50 pin SCSI which I traced to HP # 5064-7220. Thanx for the replies. I did a lot of digging around and found the info I needed. I was able to purchase a real cheap hp C1415A single ended DVD/CD unit, change out the connector on the rear and use a standard issue hp 56 to 50 pis SCSI cable to connect it to the discarded 16700A and have SAE show it as a bootable device. I then got the iOS image for the Latest LA version A.92.90.00 and made a CD. It won’t boot, but that could be anything I’ve done wrong. Drive really not notable, FIld to make a bootable CD etc. I’ll look into it when I’m board, lots of fun indeed. Thanx for the replies. I did a lot of digging around and found the info I needed. 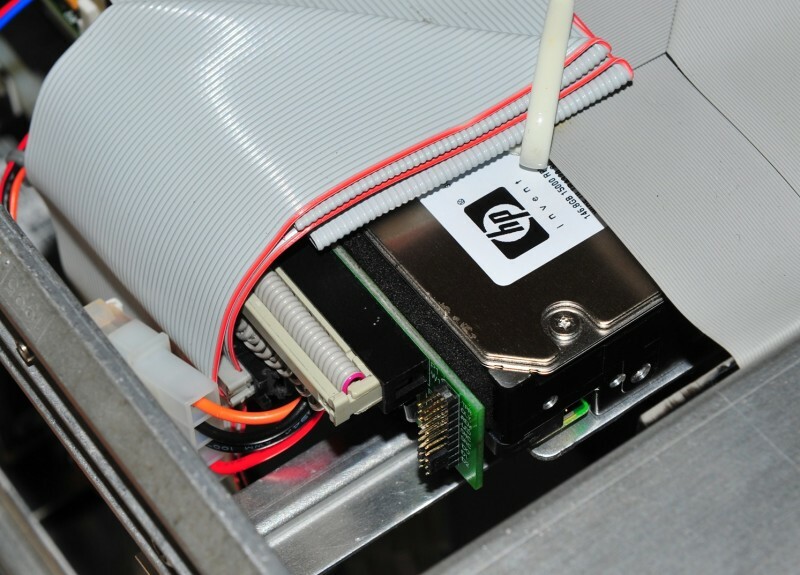 I was able to purchase a real cheap hp C1415A single ended DVD/CD unit, change out the connector on the rear and use a standard issue hp 56 to 50 pis SCSI cable to connect it to the discarded 16700A and have SAE show it as a bootable device. I then got the iOS image for the Latest LA version A.92.90.00 and made bootable CD etc. so far. . So good. I just let the reignite do its thing. I’m wondering if I should have found a way to reformat the drive first. This is because of some of the ‘unable to – – -‘ messages that came over the console before it (the HD & CD dives) did its crunch & chew job. Correction: that’s hp 1670x version A.02.90.00. It’s quite nice that they fixed the 18GB drive limitation on this new version. I just installed it on an 80GB SCA drive and are now running it on an old 16700A with firmware version 1.0. Seems faster than the old 4 GB IBM drive. Defiantly much more quiet. I just checked mine and I think it is A.00.38 1994. I’d email the HP/Agilent yahoo group. There’s usually several people on there who have a mirror of it. Failing that I do have it but it’d take me a while to upload it. The SCSI drive in my 16700B is a 68 pin. States 50 pins. Will this work in a 16700B? Does use the micro card. I am using various types of LVDS drives in my 16700A with either the HD68-pin (with adapter) or 50-pin IDC connector. hi tony did you try the codesrc SCSI2SD card? or an other card can you get in touch with me about it. did you get the itead card working? this is all because of SCSI2SD card V6 ( is not working ) now i installed V5.1 and woring right away. I updated my 16700A with A.02.90.00 and am having no luck starting a remote X session with it using Xming on a PC. I’ve used it before on othe X sessions without much problem. I think I am following the instructions detailed by Matt and are using the default Agilent password ‘uh,uhuh’. I’m able to get to the LA via PUTTY and get things started, but it refuses and terminates the X-term session with a message saying no protocol specified. I’m sure it’s just my ignorance with the LA and the details of properly starting XMing. Can any one shed some advice upon this? Hey all. I’m looking at getting one of these, but it looks like all 5 cards slots in the back have filler panels. Does this mean that it has no analysis ports? Is it not a LA until an LA card gets added? It’ll boot up, but you won’t be able to do anything with it except play with the operating system. Thanks so much for posting this information! I managed to resurrect a client old 16702B and we’re happily debugging remotely from Ubuntu. You said at the time of the writing that no LCD monitor, to your knowledge, would support 1600×1200 @ 75 MHz. Does that still hold true? And it appears as though maybe it can handle that output resolution, unless I’m misunderstanding something. It’s an NEC LCD2070NX-BK. From google, I found there’s some other LCD type monitors that supposedly can handle the 1600×1200 @ 75MHz. What do you think? Thanks! I still have never seen a panel that supports this. I very much doubt it would work. It does say up to 85Hz however this is likely to be for lower resolutions. It may or may not work, but realistically, it is not worth spending the money on. Just use Remote X.
I have been trying unsuccessfully to install a IBM Ultrastar IC35L073UCDY10 73.4gb U160 drive using the same SCA to 50 Pin adapter you have. I can not get the drive to be recognized at all in the LA. I tried setting the jumpers to force SE in case the adapter did not supply the connection along with disabling the parity, setting the Disable Unit Attention, and TI Sync negotiation. None of the combinations resulted in the drive being recognized. So my question is did you have to set any jumpers directly on the drive or adapter and if so which were they. Iv’e had real good luck with many types of Ultra-160 and 320 drives being recognized by all of my 16700/02 A/B units. Are you doing the SEA command in the machines simplex console before. You’ll need to do this for frst time drives before the system will regognize them. This is of course assuming you aren’t having any drive, cable termination or the drive is not a bootable variety. Upgrading to the latests system software is a must if the drives capacity is greater than 18 GB. I have a couple 16557D timing cards that I saved from a chassis that was being scrapped a while back, and have been considering getting a 16702B to bring them back to life. One question, though: I don’t recall if the s/w running on the chassis required licenses for each installed card, or if the licensing was only used for some of the more “advanced” features. Can anyone clarify? There are no per-card licenses. There are however some feature licenses, but I’ve not found any of those features particularly useful. I have found a way to transfer tool licenses from any 16700/02 A/B unit to any another of any type without removing such from the original target. It’s rather simple, but requires that you have access to both systems or at least the HD (or another reignited HD from the target unit) you desire the license(s) from. I desire B4605B and B4640B. hello are you still willing to send a fresh HD( SD card) with the three licenses installed. You MUST have backed up the desired system license(s) onto a floppy before this will work or to restore it onto your unit. license saving and restoration requires a woking floppy drive to do such. Do this before you do anything else. Does any one have any experience with the built-in serial interface DE-09 connector on the 167XA or B. I’m hoping to be able to log on via a terminal, but havn’t had any luck or found any good reference on it other than only beeing mentioned in the boot process. One of the 16702B units I purchased has a flaw in the touch screen. I am having to use a mouse with it. I saw posts that referenced scrapped chassis. Any chance someone has a touch screen that I can scrounge for a reasonable sum? i would like to ask a question to 16702b users. There are some logic analyzers of different ages (1670G, 16500B+prototype analyzer,1631G, 1661AS) i call my own. Bought the 1670G hoping that it would have a better performance concerning the user interface. I notice a quite slow response to user actions when using a larger amount of sample memory. Q: Does the 167002B perfom better than these models? It is my understanding that all of the 16700 models are fitted with a PA-7100LC @ 150MHz. Models with the full 256MB of RAM can be fairly good, models with less than 128MB can test ones patience. But even with a fully loaded unit the performance is less than spectacular, ultimately depends on how you use it. Large analysis sessions using many cards, large samples etc are excruciatingly slow, whereas in the case of smaller sessions perhaps using 20-30 channels the performance is quite acceptable. 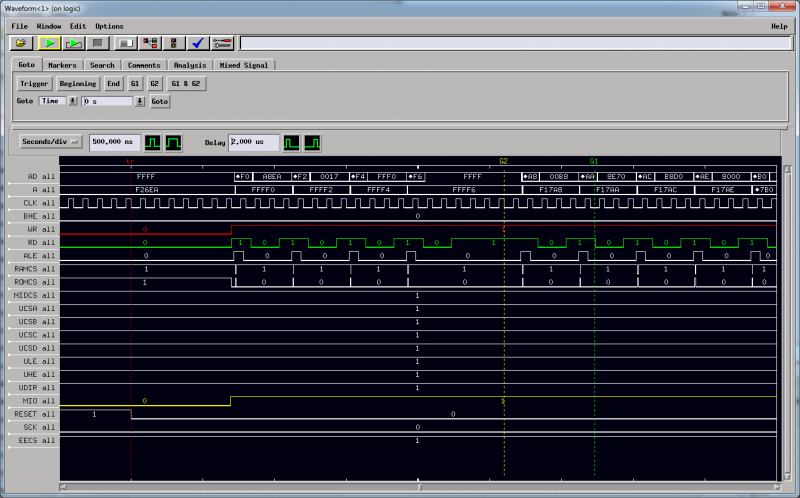 Even then, it can get slow when you zoom out, because it has to fetch significant amounts of data to draw the waveform. Yes, the B series are faster from the start as the CPU board has 128MB over the 32MB the A series. Also the B series has a 10/100 ethernet port over the 10Mb one on the A series, but this won’t mater unless your truly using the unit remote mode. 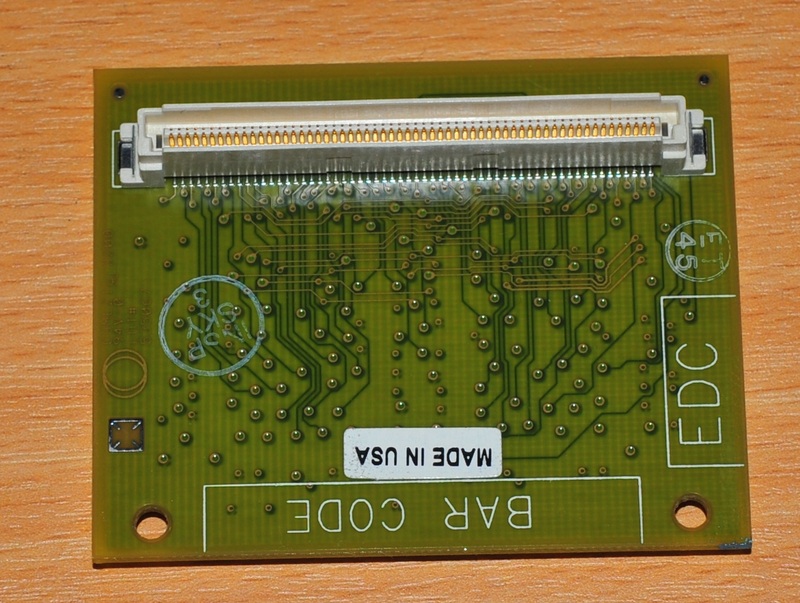 The extra RAM add-on board is 128MB and is compatible to both series. However, the user experience speed is also predicated on how clean the hard drive is as the OS will need a good sized area for OS swaps in units with memory less that 64MB and quite more so if you are running the Xterm server on the unit active or idle. More on this later. With this, any of the units 160x A or B can be slow as a sick dog with even 160MB if the hard drive is cluttered with unrecognized or corrupt files that the OS leaves alone on a reignite. Most people simply do a reignite without first reformatting the drive because it can’t (or I don’t know how to) be formatted by the unit it’s currently in. Perhaps somewhere someone has a magic floppy that does this? The 16700A/B series Opt 003 is a VRAM module plus a 128MB system RAM module. A 16700A has 32MB of system RAM on the main CPU board with a 32 MB daughter memory board giving a total of 64MB. Option 003 has 128MB on a daughter board for a total of 160MB. Option 003 has 128MB on a daughter board for a total of 256MB. 16700-97016 and the 16700B service guide 16700-97015.
hello i am looking for a long time for tool-sets B4600B, B4601B, and B4620B licenses…and more is there someone out there who can help me out..
hi guys, so am I looking for the took-sets. Yahoo group thread(https://groups.yahoo.com/neo/groups/hp_agilent_equipment/conversations/messages/69528) relating to this for un-commercial ones seems to disappear. I really appreciate for your helping to let me get the software. The old HP-Agilent equipment group has recently transitioned from “Yahoo! Groups” to the “Groups.io” website. It is now called HP-Agilent-Keysight-equipment. Most of the old group postings have been preserved. Go to ( https://groups.io/g/HP-Agilent-Keysight-equipment ) and search the Messages section for the 16700 posting of interest. Also, be sure to sign up for free membership in the group! here is the 2.90 last cdrom linked. please if anyone has a working config with Plextor in combination with SCSI2SD card.. please leave your tips…trick and config…on howto get it working many are willing to get a fast scsi2sd drive. Well, I’ve already got the cdrom from agilent, but not be able to use tool-sets such as B4605B, B4620B and so on. In my understanding, the cdrom also includes free version of the sets just for non-commercial use and license file is needed to activate them, however. I’m afraid that the file lisence is what I need. I’m running the LA on SD memory using SD-CF and CF-SCSI coversion adapters, but not using SCSI2SD, sorry. The X server runs on your PC, and the LA connects to it. You don’t connect to the LA. /;>vp & wait and see . . . . . . . .